Team Painters! Are you ready!? 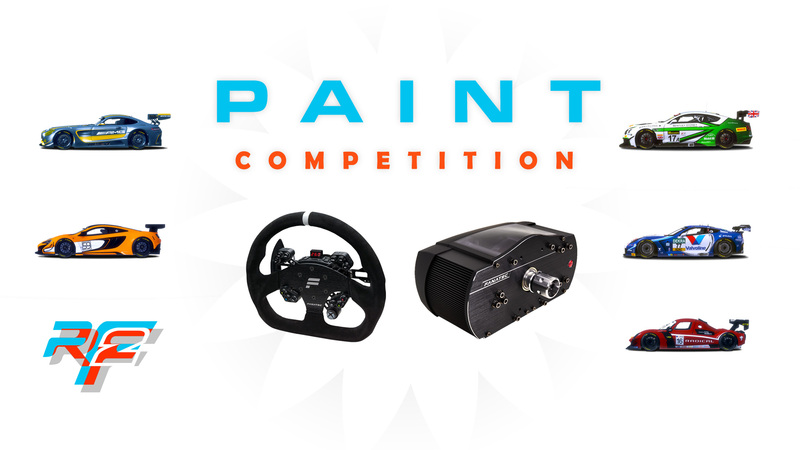 With the Holiday Season approaching, we are offering you the chance to not only win an awesome Fanatec Clubsport 2.5 base with a Clubsport GT Wheel but to get your awesome liveries into our next build update! Design your team liveries for any or all the GT3 Pack cars and submit them to us here at paintcomp@studio-397.com by the 8th December 2017. We will be accepting 10 liveries per car into the build with the best overall selected as the winner! By the way, don’t worry, this doesn’t mean we aren’t working hard to bring you more official liveries as well! Please send images of your cars and a dropbox (or similar) working file link to the e-mail above for submission. Please ensure you have the rights to use the logos displayed on the cars or we will not accept them – with common brand names we will require proof of acceptance. You can get the templates from the Template folder in your rFactor 2 installation folder. Make sure you add the PSD version of your entry alongside the DDS files that can be viewed in-game. Make sure you add your driver name + team name. Make sure you have read and understood the Terms and Conditions before making your submission. Miro, Ernie, Ronnie and 11 others like this. "NO PURCHASE IS NECESSARY TO ENTER OR WIN"
Where are the templates? Without a purchase they do not exist in "*program files\Steam\steamapps\common\rFactor 2\Templates" I didn't find anything in the workshop nor do I find stand-alone links in the forum or dev corner of the main site. Always someone who reads the fine print. . LOL . It is a fair point though. Hopefully S397 will make the skins available to those who have not purchased the pack, or show all where to find the skins. I own the pack so the skins are exactly where they said they would be. But if I did not purchase them would they be? I haven't looked into the templates, but is there a generic numberplate, which could be used? To be clear, the no purchase related to purchasing a ticket to enter (like a lottery). MarcG and GrimDad like this. No purchase necessary, but you need the templates which comes with buying the car(s). Maybe obtaining the template in another fashion is accepted but I am pretty sure re-distributing them is illegal. Besides, how can you properly make a skin without being able to see the result ingame? Some owner should be involved for both obtaining the template and checking the result to provide pictures. Guys, I think no purchase is needed means, that you don't have to pay any cent to "register" for the competition. What about those of us who are artistically handicapped. I'm so bad a painter that the graphic programmers have banned me from using their products so I don't make THEM look bad! Postipate, John and GrimDad like this. To win Lottery! Buy a ticket first! Questions, that I relatively haven't seen answered. 1. Number plates (can we use our own?) Being that we are providing a psd, that could be changed, since these might b\make a build. 2. I understand the rights part (As I have 3 official sponsors to use with permission), what about contingencies that might be on a template. 4. So far I'm seeing the 488, 911, Merc, McLaren, Camaro, Bentley in the GT3 pack correct? Dunno about 1 & 2 but 3 is no and 4 is not correct, it's the GT3 pack that Studio 397 released a month or so ago, Bentley, Merc, McLaren and Corvette. I thought your favourite were the Ferrari 488 and the Camaro that you included in the GT3 power pack. Imagine from the vehicle he lists, it would be Simtek's "GT 3 WORLD SERIES", not APEX GT3. Yeah, the Simtek is what I was looking at, But thank you. got it now. Guys! How about posting this here? Honestly, communication isn't your strength! peterchen, Ernie, SPASKIS and 1 other person like this.